I will be honest up front, this isn’t a totally new recipe to me. I have made it once before a long time ago. However, the week flew by and I needed a recipe. 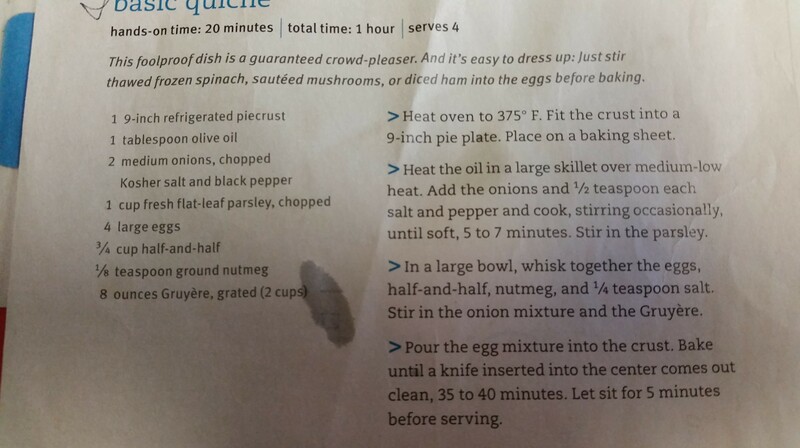 I decided to make Quiche for the family on Valentine’s Day and found this old recipe in my files. It is sooooo good. 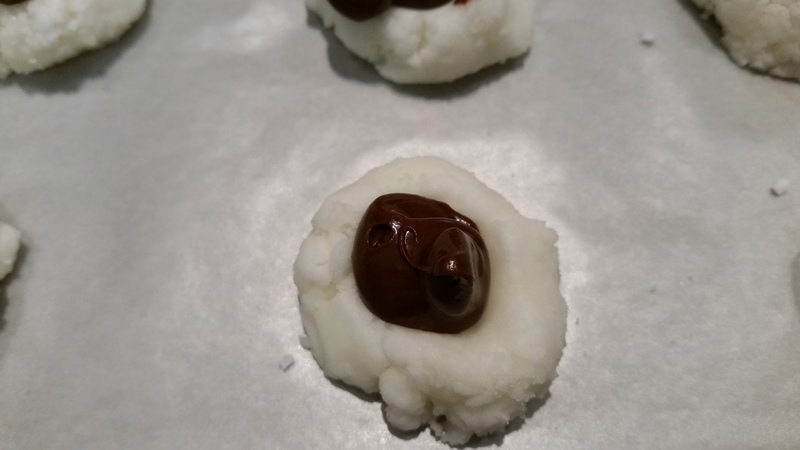 I actually wrote at the bottom of the recipe “Pass along – yummy.” I am sharing it with you this week. It truly is scrumptious. We devoured it. Actually, we ate it so fast I forgot to take a picture. 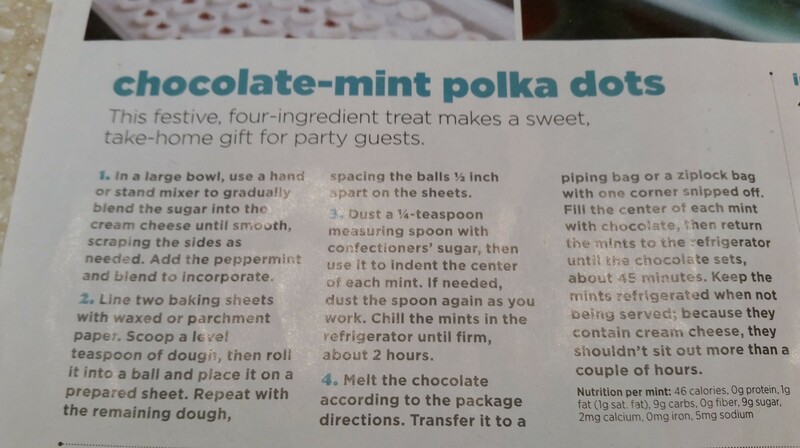 I have the recipe though (Real Simple, January 2009). I used one large onion instead of 2 medium onions. I had no parsley so I had no greens in it. I was going to add broccoli that I had in the refrigerator but I knew the kids wouldn’t eat it. Since it’s Valentine’s Day, I decided to forgo greens. I added a 5th egg because I wanted more egg. Lastly, I used the cheese I had at home. It wasn’t Gruyère. 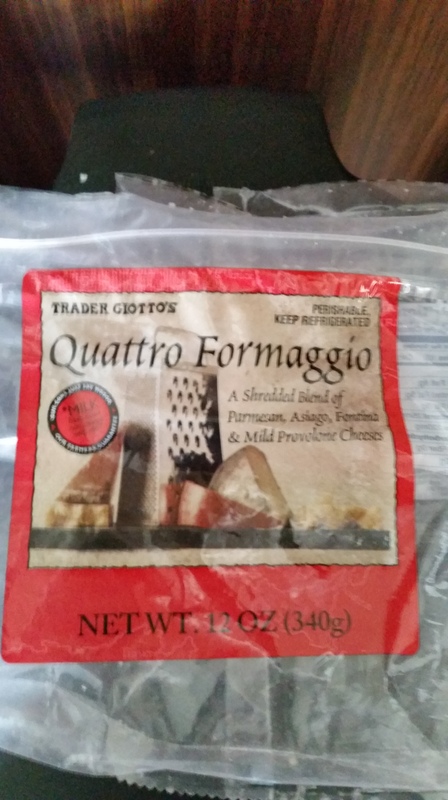 I used 3/4 cup of Fontina and 1 1/4 cups of Quattro Formaggio from Trader Joe’s (picture of bag below). I highly recommend the Trader Joe’s cheese for Quiche. It’s fabulous. The kids suggested we add ham or bacon next time. I used a frozen pie crust I had in the freezer. You don’t need to thaw it, just pour the filling in and bake. Mine overflowed a bit onto the pan. Thankfully, I thought to put a cookie sheet with a lip underneath it. I’m not sure how your family spends Valentine’s Day but since it’s normally on a school day, we have the tradition to celebrate at breakfast together. Today, we had strawberries, juice, Quiche, hot tea, and donuts. The kids got a few small gifts and of course, conversation hearts. However you celebrate, if you even celebrate, one thing to remember today is how much God loves you. I wrote my kids cards and said how much I love them. As I was writing, I was struck by how much more God loves them and me. It’s overwhelming. Although it may be a cliché verse (is that possible? ), it says it best. The rainbow haired guy at the football and baseball games has it right. God loves us sooooooooooooooooooooooooo much. We all have the ultimate Valentine if we choose to believe. Hoping you embrace His unconditional love today. Long week but I found time for a new recipe. Saturday night I made this for my family. Most of us liked it but decided it needed more seasoning. The recipe only called for garlic, salt and pepper. Not enough flavor. Also, I felt the ground beef tasted not only bland but a bit heavy. I always make a recipe as written the first time. Next time, I will add some seasoning and will use ground turkey. 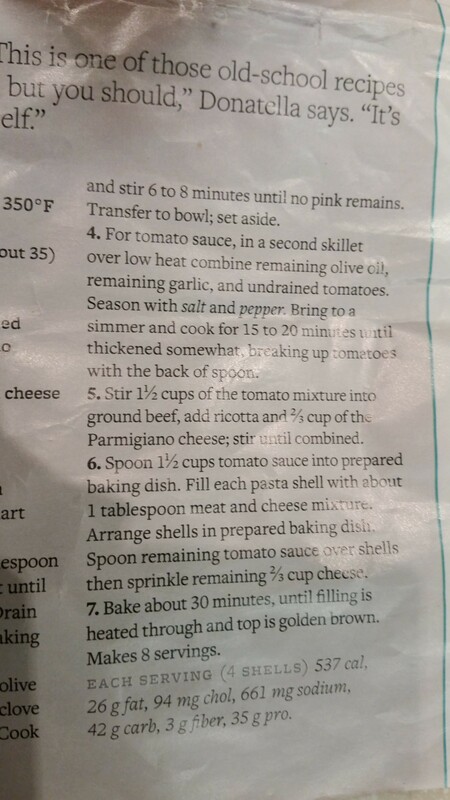 As you can see, another recipe with a lot of cheese. At least it added some flavor. In a pinch, I would make this with store-bought pasta sauce. This was a fun recipe to make. I have never attempted homemade pasta sauce. I didn’t even know that large shell pasta existed to buy and stuff yourself. I found it inspirational to make. It had been a busy week and I enjoyed my hour in the kitchen preparing. I missed cooking “real” food this week. Lots of simple meals and a few frozen. Baseball, soccer, scouting, and other things filled our week. Having time to cook and prepare food fresh cleared my mind. 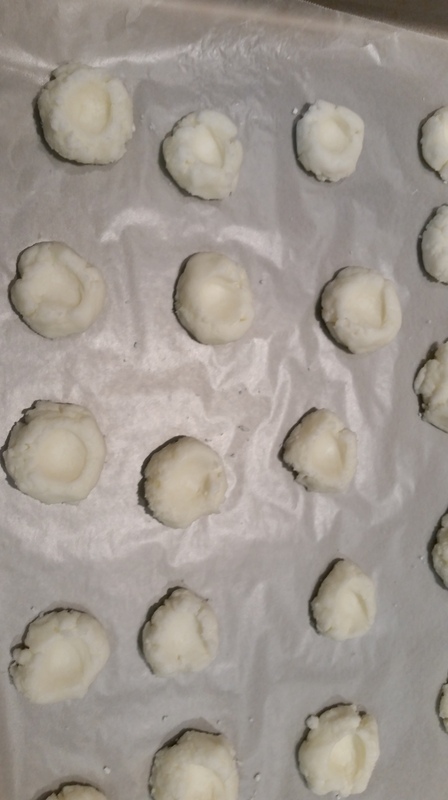 I actually thought of other ways to stuff the shells to make them yummy. Maybe I will experiment with this recipe a bit. I am finding my cooking time is more refreshing that it has been in the past. These new recipes are a challenge but also a motivation. It is another busy week ahead but I will attempt to find something to add to the menu from scratch. My encouragement to you this week is to find out what meals you prepare that relax you or inspire you. Make those regulars on your meal rotation. The time in the kitchen can be an escape from a busy week. I think I was more stressed making grilled cheese one night than the night I made the pasta. The main difference: I was not rushed to make the pasta. The grilled cheese night was make something quick, easy, and it needs to be ready 5 minutes ago. Those are not fun moments in the kitchen. This week I have one weeknight without a crazy schedule. I look forward to my kitchen time that day. On busy days, we need to eat. We do. 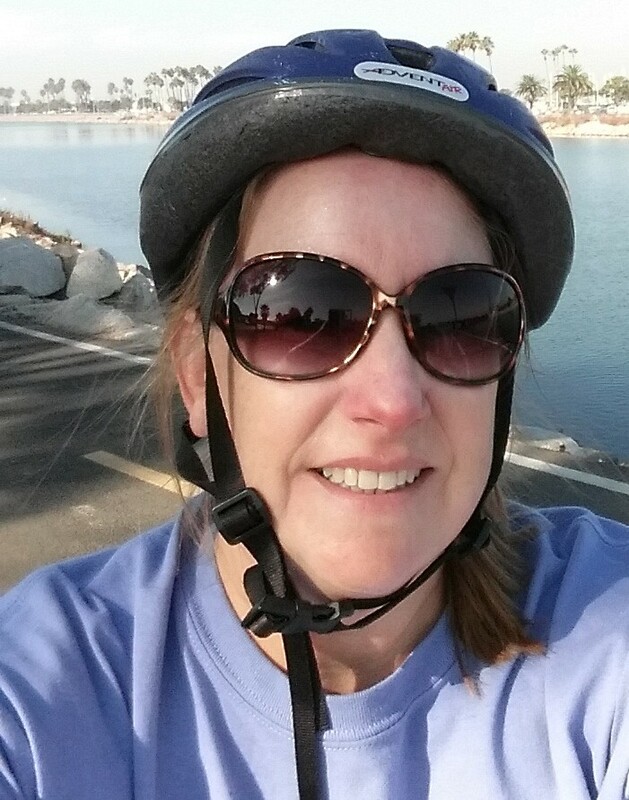 On more relaxed days, we need to eat but we also get to savor the food and each other. Hoping for more of those days in our homes. 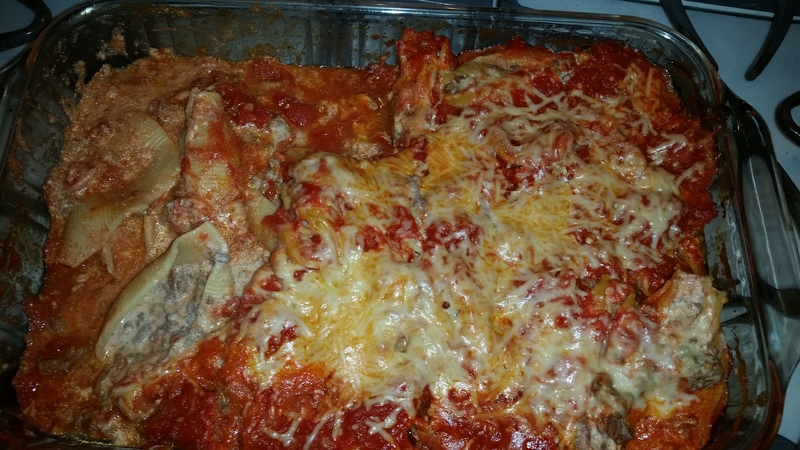 Here is my picture of my finished product and the recipe. Hummus is a staple in our home. Pita chips, bell peppers, carrots, broccoli (well, only I eat the broccoli) and other yummy dippers bring us delight. However, I have never made it from scratch. All ingredients were easy to find except the Tahini or sesame seed paste. Nothing at Ralphs. Trader Joes has a Tahini sauce they said is much thinner but many people use it to make hummus. Of course, they were out of stock. So I called Sprouts and they had it. I wish I would have taken a picture of the Tahini paste. Have you ever bought natural peanut butter? You know you have to stir it well to mix in the oil that separates. Same is true of the Tahini paste. However, much, much, much stickier and thicker. I stirred, and stirred, and stirred and got oil on my clothes so I took a stirring break to get the oil out of them. Then I put on an apron and began to stir again. Barely incorporating the oil and paste. Finally, I used the best tool in the kitchen, my hands. 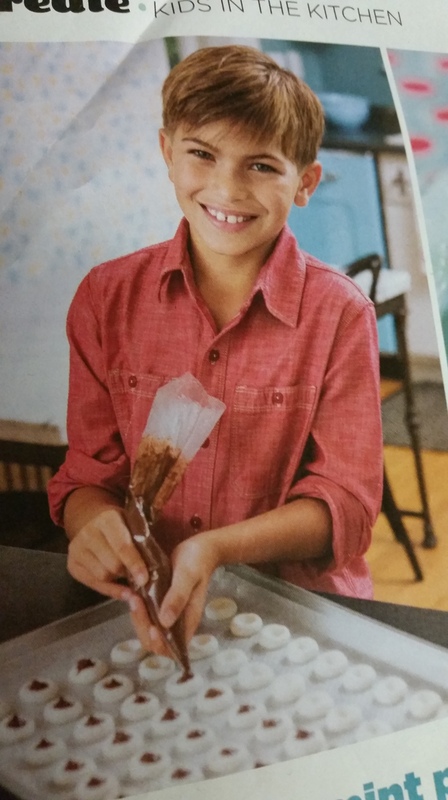 I got 1/4 cup worth mixed and my son and I began the fun of running the food processor. After some time in the refrigerator, we brought out the hummus to serve with dinner. We ate almost all of it. Another success. The one change is that I would be less generous with the lemon zest. It was a bit too lemony. The great thing is that I can tailor the flavor in the future. Most of the time I will still buy store-bought. 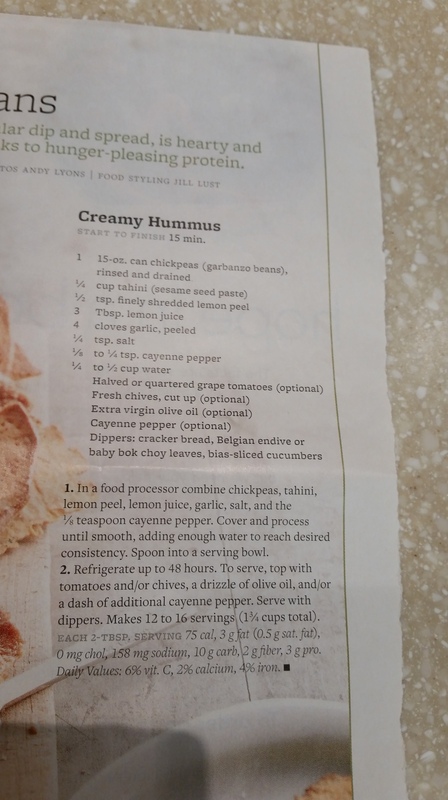 For special occasions or just for fun, I now know I can create customized, homemade hummus. I would like to try it again with the Trader Joe’s Tahini sauce since it’ll be easier to mix. I grew up in the Hamburger Helper generation. This was when our moms finally got a break from cooking from scratch all the time. We have so many conveniences now, we forget our moms didn’t have these options as readily as we do. I remember hearing a speaker when my kids were babies. The speaker encouraged us moms to start cooking from scratch again. With babies at home, I completely ignored her. However, a few years ago I pulled out my notes from that talk. I began making homemade pancake batter. I must confess I thought Bisquick was the only way to make pancakes. To my delight, the kids preferred the pancakes from scratch. They were fluffier too. I keep Bisquick on hand for crazy mornings but more often than not, homemade is used. I encourage you to find a food item you serve regularly and attempt to make it from scratch. You may be pleasantly surprised at the results. You may be so frustrated that you will curse my name and rush to Ralph’s for a store-bought item. Either way, you tried. For me, (true bakers forgive me), I will never make homemade pie crust again. So not worth the effort. That’s a whole other story for another blog. Get out there and homemake something. Guacamole for the Super Bowl is an easy first step. Let me know what you try. Homerun! Or better yet, Touchdown!!! (It is almost time for the Super Bowl.) My kids aren’t fans of most potatoes. However, they devoured this one. This side dish became the star of dinner. I can’t give this recipe enough stars. I highly recommend it. The steps were easy too. I liked semi-smashing the red potatoes right in the skillet. Easy, no messy bowl to clean up, and it moved easily from the skillet to the baking dish. The panko, parmesan cheese, and olive oil topping gave a nice crunch. I am not sure how many of you enjoy cooking. Some cook out of love, others out of necessity, and some a blend of both. However, this week I didn’t feel well. Cooking dropped off my list of things I wanted to do. My family needed to eat and I had already purchased the ingredients for this new recipe. My husband covered the main dish while I used my limited energy to make this side dish. That fact alone should tell you how easy it is to make. Also, when you have “one of those days,” sometimes preparing a meal for those you love can brighten your day. I felt so satisfied when we sat to eat and they loved my dish. I couldn’t give much else that day but this small side dish became my act of love for the day. Honestly, frozen chicken pot pie is an act of love when you are having a tough day. Every time your family or friends put a fork in their mouth with something you prepared, they are receiving much more than nourishment. It’s all a gift of your love. 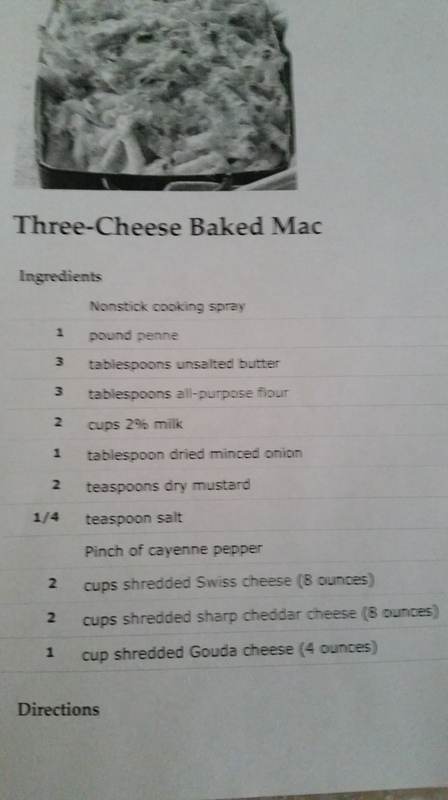 I have been looking for a good three cheese macaroni dish for some time now. One of my kids ordered it at a restaurant and it was fabulous. After several failed attempts (including one made with cheese whiz from a jar), we found our recipe. Week 3 is a success. Yahoo. 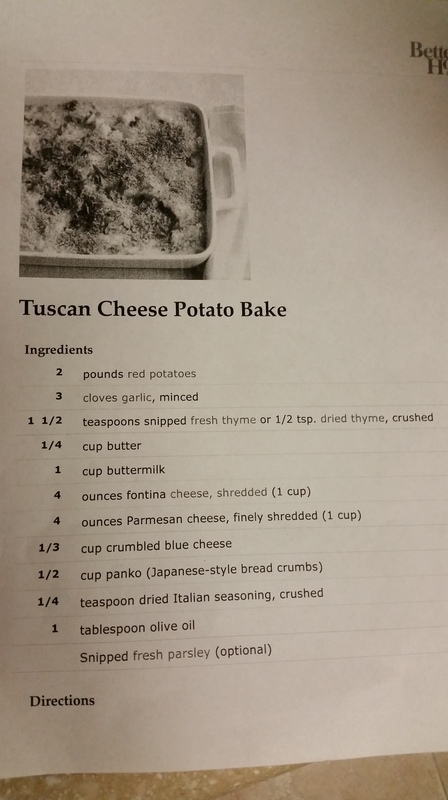 It is an easy recipe. It is a yummy recipe. It’s a new keeper in our home. With 5 cups of cheese, it isn’t healthy. However, when Gouda, Swiss and sharp cheddar are combined, calories don’t matter. We actually all decided diced ham would be tasty in here too. So, I recommend it wholeheartedly, even though it isn’t heart healthy. On a personal note, cooking for my family, although tiresome at times, is a joy. I am not a great cook but I cook some good stuff. We remodeled our kitchen several years ago and knocked out a wall to open up the kitchen to the living room. We also put a large workspace between the two rooms with a prep sink on the kitchen side and 3 stools on the living room side for my 3 kids. I can interact with them while doing my prep work. It is wonderful. I often include them in helping with a part of the meal. Sharing the load, sharing conversation, and sharing life all happen before we even get to the dinner table. Cooking is connecting. Try Week 3 or a healthier option of your choice. I encourage you to cook and connect. On a side note, before my remodel, I had a long skinny galley style kitchen. I was completely cut off from the rest of the house. If your kitchen is small, secluded, or just inconvenient for many people to be in there, I encourage you to ask one person to come help you each time you’re cooking. It will allow connection and restore the joy of cooking. If you are a lone cook because you prefer it done right, invite one person into your space and give them a task that isn’t crucial or just ask them to come sit while you cook. The goal is connection not perfection. Happy New Year! (Cool phrase on this float!!!) Welcome to my 2nd year of blogging. I am very excited. For my long term followers, you already know that every new year I take on a new challenge. 2013 was a cup a tea a day. I love tea but realized that I never took the time to slow down to drink it. I logged every type of tea I drank along with the setting and people I enjoyed it with. This wasn’t a blog just a personal goal. 2014 was starting a blog about getting rid of one item a day. Within a few weeks, it became a weekly blog with a lot of items lumped together. What a journey we had. So, now it’s 2015 and it’s time for something new. Please invite your friends because this is going to be an adventure. 2015 THEME: A new recipe every week. In November, I began praying for a new idea and this instantly popped into my head. I sat with it for a month and continued to pray for wisdom. This was my only idea but I liked it. So, I believe this is the direction God wants me to head this year. More home cooking and sharing it with my followers. Last night I ventured into my first recipe. 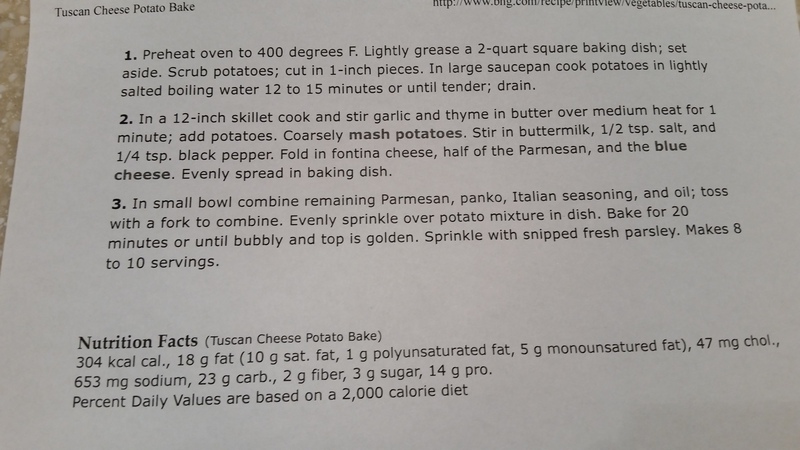 I posted a photo of the recipe and hope this format will work. If not, let me know and I can type it in. I realized I should have taken a photo of my finished product. Alas, that won’t be possible for week one of this experiment. So, plan on photos from my kitchen every week. I should say the following caveat, I am not a chef. I can get good food on the table for my family and I follow recipes well. I will have mishaps (those will be some of the best blogs) and I may even miss a week (we all deserve a break at times). I hope you follow me and try some of the recipes. Here is something new though, I want more feedback. If you try a recipe, let me know. If you have a suggestion to improve a recipe, pass that along too. 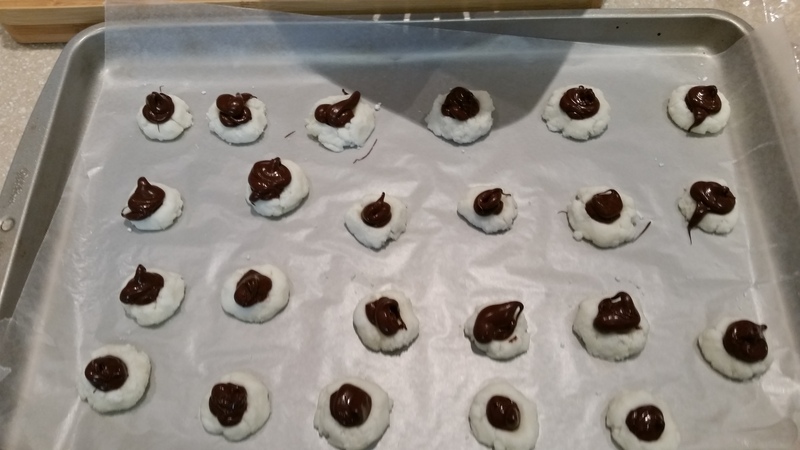 If you have a better recipe that’s similar to one I tried, post it. Let’s be more interactive this year. I have also embraced my role as author this year. I just registered for a writer’s conference in April. I plan to pitch my novel as well as a non-fiction book I want to write. My web presence is important to publishers. It shows people want to read what I write. I would like to increase my following 100% by April. Right now there are 30+ followers so I need 270 more people by April. Get the word out. Get me followers. I would appreciate it. The past year my blogs usually had a spiritual lesson with them. Not sure how God is going to reveal himself through raw chicken but I trust He will. So onto, my first recipe. 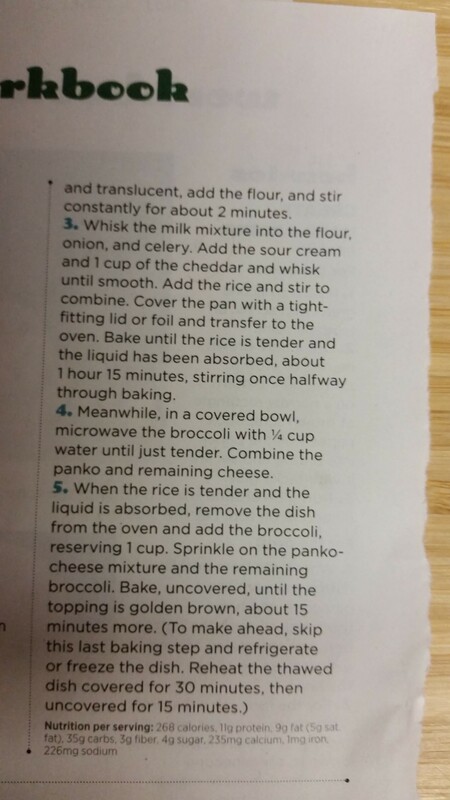 I made a Creamy Baked Broccoli Rice from Family Fun December/January 2015. It was more time consuming than I thought. It baked for 75 minutes. We watched over half of a movie while it cooked. 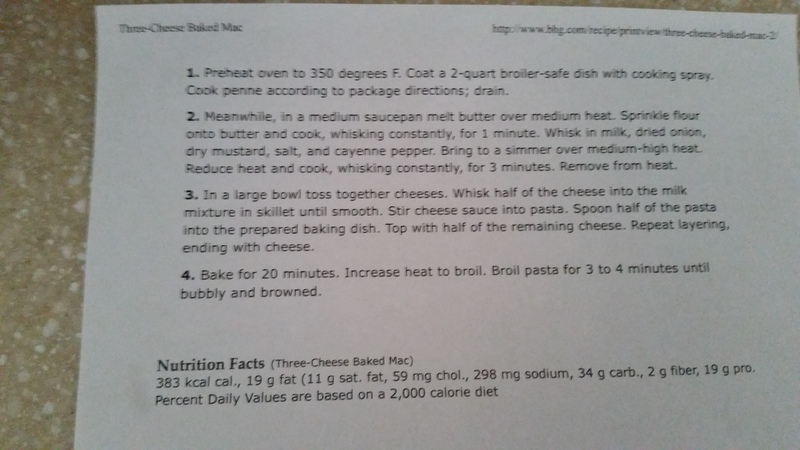 I had to add cheese, panko and broccoli then bake for 15 more minutes. The panko didn’t brown so well but I took it out anyway to serve it. The bottom burned so that part was inedible. The top and middle were good though. I most likely won’t make it again because it took so much preparation for little payoff. If I did make it again, I would stir the rice after the baking period was over before I added the broccoli. I would put it on a higher rack to prevent a burnt bottom. I will, however, add some precooked diced celery and onion to future rice that I make and a bit of sour cream. The sour cream made the rice creamy and yummy. Should you try it? I would say yes but consider my suggestions for how to prevent burning. If you are lactose intolerant, run from it. It has 2 cups of milk, 2 cups of cheese and 3/4 of a cup of sour cream. Heaven for me though. So there it is. The start of new year and new idea. Join me. Bring a friend. Share your ideas and recipes. I am grateful God gave me this idea. I am excited about it. Here we go. P.S. The featured image is from the Rose Parade. Our family has a tradition of attending every year. Such a joy. Thanks to the Strong family for letting us join their amazing location the past few years.